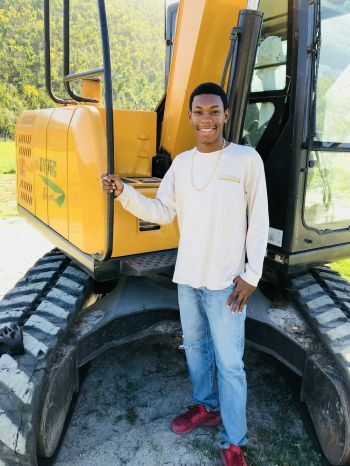 Our young professional this week is L’rique L. George, who developed a passion for operating heavy equipment at a very young age. L’rique, 20, is a Heavy Equipment Operator at J and L Trucking. He hails from East End, Tortola. His job responsibility includes cutting foundations, cutting and cleaning roads and digging trenches and footings. In addition, L’rique is responsible for demolishing structures, cleaning drains and whatever else that requires the use of a heavy equipment. Our young professional expressed that his dad inspired him into his current career field, adding that his dad is also his greatest inspiration overall. 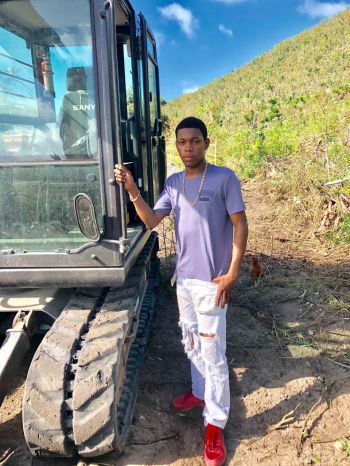 L’rique lamented that on one occasion when he was around the age of 8 or 9 years old, his father allowed him to operate one of the heavy equipment and noted that was when he found the passion for heavy equipment. “After showing me how to move the machine, he let me track it all the way down to the ramp where the barge was located. Ever since then, I had a passion for operating heavy equipment,” said our young professional. L’rique stated that he has been working part time as a heavy equipment operator since he was in high school and college, adding that after college he has been working full time for 3 years. As a heavy equipment operator, L’rique was tasked with the responsibility of clearing debris from the roads and driveways following hurricanes Irma and Maria in September 2017. He disclosed that he assisted in clearing a number of drains from debris just before Hurricane Maria hit the territory. L’rique attended the Willard Wheatley Primary School and the BVI Seventh-day Adventist School. After completing his high school education, our young professional pursued a degree in Architectural Engineering at the H. Lavity Stoutt Community College. L’rique expressed that his ultimate goal is to one day own a heavy equipment operating business that will also be able to teach others as his dad taught him. “I see myself reaching to the point where I can teach and even hire others to work for me,” remarked L’rique. Our young professional stays focused by paying attention to how far he has progressed in his career field and having the drive and passion to wanting to reach even further. 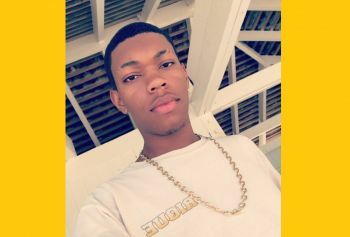 When L’rique is not operating a heavy equipment, you can find him sailing the waves of the ocean or getting his hands dirty fixing boats and car engines. “Find a job that you have interest in and stay focused. Keep out of trouble and save your money until one day you can start your own business and build yourself up to that position you want to be in life,” advises L’rique L. George. mi boy and to others out there too. I don't like the cut up eyebrow look though as most gangsters like doing this.I hope you not into that.Stay cool too and continue to help others and give back when and where you can. Love what you are doing with this article Renee, highlighting our focused hardworking young people in positivity and not violence all the time on the news sites. Stay focused young man congrats. Good job youth. keep focused. when i scroll down on the page ans saw his picture my heart skip a beat, but after reading the headline i felt so relief, its so nice to see a young man on the news doing something positive, i do hope some more young people will try to make the news in a positive way.